Pedigree Dentastix 28 Stick Medium helps dogs to lead a healthy and contented life for as long as possible, they need to have healthy teeth & gums. Pedigree Daily DentaStix are tasty chews especially developed with Waltham vets to keep your dogs teeth and gums strong and healthy throughout his life. 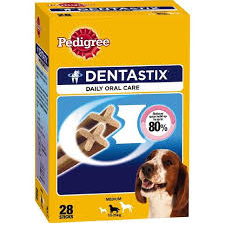 When fed ever day, it is clinically proven that the unique shape and texture of Daily DentaStix can reduce plaque and tartar build-up by up to 80%. Pedigree Daily Dentastix, You clean your teeth every day.